For the characters from which the character receives her design, see Gwen Stacy and Deadpool. Gwendolyn "Gwen" Poole is a fictional character who appears in American comic books published by Marvel Comics, originating as an amalgam of Gwen Stacy and Deadpool on a variant cover of Deadpool's Secret Secret Wars #2, one of twenty variant covers published due to the popularity of Spider-Gwen from June 2015. Marvel initially produced two stories featuring Gwenpool as a character, a backup story in the series Howard the Duck, and a one-shot Gwenpool Holiday Special. A retcon in the Howard the Duck #1 backup revealed her name to actually be "Gwen Poole." 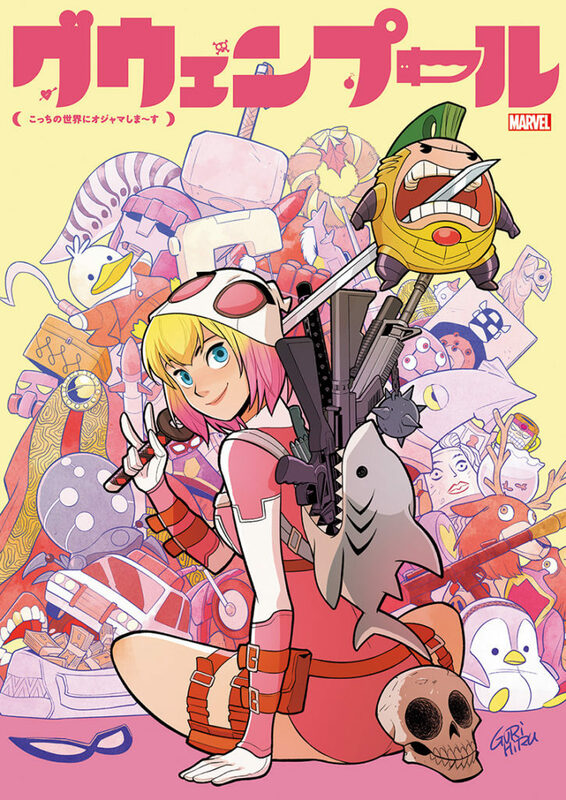 Following the publication of the one-shot, an ongoing series titled The Unbelievable Gwenpool by the same creative team was announced, which started in April 2016. The Unbelievable Gwenpool #0, collecting Poole's appearances from Howard the Duck and the first Gwenpool Holiday Special, was later released. 2.7 The Unbelievable Gwenpool Volume 2: Head of M.O.D.O.K. In June 2015, following the popularity of Spider-Gwen, all Marvel titles being published had alternate covers with Gwen Stacy reimagined as other characters, such as Doctor Strange, Groot and Wolverine. One of those was Deadpool, featured on Chris Bachalo's variant cover for Deadpool's Secret Secret Wars #2. After seeing how many fans were cosplaying as a character who was not even featured in any comic, Marvel editor Jordan White approached writer Christopher Hastings and editor Heather Antos with the task of creating a story around her. Initially the plan was to do one-shot comic "Gwenpool Special #1" (December 2015), which was then followed by introducing the character prior to the special with a three-issue backup story in the ongoing volume of Howard the Duck (November 2015-January 2016). After a meeting with White and Howard the Duck editor Will Moss, Hastings came out with the idea of a fourth wall-breaking character similar to Deadpool, "but it comes from this place of knowing she is in a comic book because she is from a world where the comic books actually exist", which would also lead to a Deadpool-like cavalier attitude "because she doesn’t believe there is any consequences to her actions", something Hastings summed as "she decides to use that [comic book] knowledge like she’s in Grand Theft Auto or something". A contrast would be that Gwenpool lacked any of the training or superpowers Deadpool had. The Howard the Duck arc, from November 2015 to January 2016, was drawn by Brazilian artist Danilo Beyruth, and the holiday special, published in December 2015, had art by Japanese duo Gurihiru. Once Marvel decided to make a Gwenpool ongoing series (named The Unbelievable Gwenpool), starting in April 2016, Hastings asked for Gurihiru's return to the artwork team, with the title being edited by Antos.The Unbelievable Gwenpool solo series ended at issue #25. Gwen Poole arrived to the Marvel Universe from what she claims to be "the real world." Unwilling to be an "extra," she went to a tailor for super-heroes and requested her own costume to stand out. The tailor (named Ronnie) complied, but misread Gwen's application form, and thought Gwen went by the alias of "Gwenpool", leading to a costume similar to Deadpool. Ronnie chose pink because of Gwen's pink highlights, but also wanted her costume to stand out and get rid of her excess pink fabric. So far she has yet to reveal the details of her old life, though she told Rocket Raccoon that in this comic universe she is not lactose intolerant. All we know is that she felt erasing herself from her old life and her parents' memories was "for the best". Gwenpool's first appearance as a character was in Howard the Duck Vol 6 #1, when she was involved in stealing a humanity-destroying virus from Black Cat and selling it to Hydra to get money easily, believing that the Avengers would simply deal with any consequences. In order to prevent Black Cat's Gang from finding her, Gwenpool killed a corrupt member of the NYPD whom the Black Cat was going to ask for help. Believing (correctly) that Black Cat was going to resort to blackmailing Howard the Duck into helping her, Gwen broke into Howard's office and hid under his desk. Gwenpool then revealed herself after Hardy left, and attempted to assassinate Howard, reasoning that as Howard was a fictional character, he would most likely come back even from death. When she revealed the item she had stolen from Hardy and to whom she had sold it, Howard scolded her and informed her that the Avengers were not available to save the Earth from the virus. Guilt stricken, she then set out with Howard to retrieve the virus from a Hydra base. Gwenpool and Howard assaulted the Hydra base storing the virus and made their way to a laboratory where an agent was testing on it, with sights on releasing the virus. Gwenpool took the virus' container and drank it all, mistakenly believing it was the mumps, a virus she had been vaccinated from in her home reality. The virus started to mutate Gwenpool, and the Hydra agent gave her the cure to prevent her from infecting the base. When Howard met up with Hardy to return the box that supposedly contained the virus, Gwen appeared dressed up as one of the members of the organization that had sold the virus to the Black Cat, pretending to desire the box back. Using the money obtained from the transaction with Hydra, Gwen bought the box from Hardy, preventing her from discovering it was empty. During the Gwenpool Holiday Special, Gwenpool is hired to kill Orto, a snake/human hybrid assassin. She encounters him in his building and then kills him with a bomb. Gwenpool then attends a Christmas party hosted by She-Hulk, where she's seen talking to Ms. Marvel. They later go to the karaoke machine. Following the events of Gwenpool Holiday Special #1, Gwenpool becomes a full-time mercenary, getting the news of different freelance jobs from her tailor, Ronnie. While trying to deposit the money she made killing a giant snake-man named Orto, Gwen stopped a bank robbery by killing all of the robbers, she gets arrested along with the gang's hacker Cecil. The arresting officer spontaneously decides to retire, and Gwenpool enlists a reluctant Cecil as her sidekick after the cop arresting them took her money and early retirement. After a mission revolving around extraterrestrial arms dealers where she killed MODOK Superior's best agent and took credit for his work, MODOK tracked Gwenpool down. He murdered Cecil in order to force her to become his henchman and an agent for his Mercenary Organization Dedicated Only to Killing. MODOK Superior then sends Gwenpool with his elite squad, which also features Batroc the Leaper, the alchemist Mega Tony, and the magician Terrible Eye, to find and kill the Seed of Pains, an evil Asgardian wizard who was under police custody. Upon getting the wizard away from the cops, they're ambushed by Thor, who needed him to save a dying elven colony from a rare root that infected them. Gwenpool distracts Thor and then kills the Seed of Pains with a bazooka. Mega Tony extracts the wizard's powers, places them in a spray bottle and gives it to Thor, who leaves to save the elves. While MODOK Superior and his squad celebrate, an upset Gwenpool is approached by Batroc, who threatens to expose her lack of powers and abilities to MODOK Superior, but agrees to give her basic combat and firearms training. Gwenpool then got Ronnie to set up a meeting between herself and Doctor Strange, in which she explained to him that she was from a reality where all Marvel characters are fictional characters in comic books. Doctor Strange agreed to transfer the data from Gwen's original world to create a fake background for her in the Marvel Universe, so that she could get her Social Security number, driver's license and other essential documents. However, MODOK Superior also discovers Gwen's background and swears to destroy Gwen. He sends the other mercenaries on a mission without her. When she questions him, MODOK Superior reveals that he knows who she is and believing her to be useless attempts to kill her. Gwen and MODOK then engage in battle, with Gwen using the skills she learned from Batroc to gain the upper hand. Eventually MODOK Superior activates a rocket chair and sends a barrage of weapons against Gwen, but is defeated once Cecil's ghost hacks into MODOK Superior's defenses and sends him into space. During the Civil War II storyline, Gwenpool appears in Georgia attempting to catch an alien smuggler named Chammy, who was living in a rural neighborhood under the name Chandler and was trying to leave Earth, only to discover that Rocket Raccoon and Groot are also after him. After an intense fight between them, they manage to catch up to him and end up fighting Reeve, an alien that can absorb memories out of heads, who put the bounty on Chammy. After Reeve defeats them and escapes, Chammy tells Rocket, Groot and Gwen that Reeve is looking for a formula that could temporarily neutralize Captain Marvel's powers, allowing him to kill her. Gwen refuses to help at first, under the logic that Captain Marvel, being one of most important "characters" in the current "story", would not be killed off in "a comic about a talking tree and raccoon". However, after coincidentally running into Kitty Pryde, Gwen falls under the mistaken impression that the comic she is currently in was being written by Brian Michael Bendis, a "big-deal comic book writer" with a fixation on Pryde who would have the authority to kill Captain Marvel. Convinced that Captain Marvel’s life is actually in danger, Gwen accompanies Rocket & Groot to the Triskelion, where they manage to catch up to Reeve but he knocks them down. Just when he's about to kill Captain Marvel, Reeve is defeated by Chammy. While Chammy returns home with his human girlfriend Ruth, Rocket, Groot and Gwen part ways, as Gwen realizes that the real writer put Kitty Pryde on the street to trick her into helping. A second Gwenpool Holiday Special made its debut in December 2016. After Gwenpool notices that the reality of the Marvel Universe has been altered, replacing several holidays (set during her time leading MODOK's former henchmen), she set out to find out what was wrong. Gwenpool discovers that Santa Claus is responsible for the changes, having erased himself from Christmas to have a vacation: Gwen was unaffected due to her being from another dimension. Gwen explains that as a side-effect of Santa's magic holidays, new holidays such as "Pantsgiving" and "Namor's Feast of Fish" have replaced the usual ones, with Christmas being replaced by "The Coming of Galactus, The Bringer of Gifts". Santa reveals that he was planning to restore the holidays after the New Year, but offers to restore them now instead. Although Gwen initially considers waiting until after New Year to have the holidays restored, as the new holidays would allow her to visit her family in her home dimension, she ultimately decides to restore Christmas, and returns to her headquarters to celebrate with her friends. The Unbelievable Gwenpool Volume 2: Head of M.O.D.O.K. She then heads to a meeting with MODOK Superior's mysterious client until she meets Miles Morales, the second Spider-Man, in the subway train. After an awkward introduction, Gwenpool follows Miles to his school until an explosion happens in one of the classrooms. Gwen and Spider-Man manage to rescue the students in time. Returning home, Miles finds Gwen in his house, who convinces him to investigate the explosion. They track it back to a classmate of Miles, who Gwen attempts to shoot. Spider-Man scolds Gwen for the murder attempt and, after a brief fight, webs her and leaves her for the police. Gwen is busted out of jail by Batroc and reunited with the others, and sent to meet the client in his Brooklyn home. The client, named Vincent, asks Gwen to assume command of the MODOK organization and kill the alien arms dealers, known as Teuthidans. In the meantime, the Teuthidans, attack New York, discover Gwenpool's identity with the help of the NYPD and ask them to send their cops after Gwen. Gwen escapes the police by jumping on a moving subway train, and once back at the base, she forms a plan to defeat the Teuthidans: while the others distract the cops with a fake crime wave, Gwen will kill the Teuthidans. Arriving at Times Square, Gwen tries to call the others until Vincent appears behind her. When Cecil arrives and tells Gwen that the others were captured by the Teuthidans, Vincent reveals that he told the aliens, believing that the MODOK mercenaries were the real problem with the world and is obsessed to learn about Gwenpool's world without superheroes. Gwen then grabs her gun and shoots him in the face, while discovering that Vincent is a Doombot in the process. Vincent reveals he survived a time travelling elderly Squirrel Girl's hobby of ruining Doctor Doom's plans, and turned against heroes and other weirdness when living with a younger Tinkerer, before attacking Gwenpool, who escapes with Cecil on their cop car. Back to the mobile base, Gwenpool transports it to Vincent's house, where the Teuthidans are hiding with Gwen's team. Assisted by Vincent (when Gwen threatens to kill his elderly neighbors if he does not assist) and MODOK's other agents, Gwenpool defeats the Teuthidans, but destroys the MODOK base in the process. After escaping, Batroc and the others decide to disband, despite Gwen's attempts to keep them together. Gwen appears in Champions Vol. 2 #5 along with Ms. Marvel, (whom she met and befriended at She-Hulk's Christmas party in "Gwenpool's Holiday Special #1") and every Champion minus Spider-Man, whom Gwenpool says (and whom Gwenpool assumes is absent due to their conflict in her solo series) hates her. She claims she's joining the Champions, attacking the police officers (and blowing up their cars) who were ignoring hate crimes in the area due to their sheriff being responsible. Gwen assumes that these dirty cops will turn out to be super villains, as that is usually the case in comics like these. Her attempts to use comic book logic run up against the others' realistic expectations of non-super villain racism and bigotry being the cause, going to try and find "Mesmero or some other villain" behind it all (she believes that all evil is caused by super villains). They demand proof that the dirty cops are controlling people's minds, only to be provided with "the air of fear" as an explanation by Viv Vision. Gwenpool and the Champions eventually convince the sheriff's deputy to expose him. Gwen is then hired to kill a vampire in a small town, until she discovers that the mayor is a necromancer who was resurrecting the town's dead citizens and the one she was hired to kill was Blade. After a brief fight, Gwen manages to explain everything to Blade, who gives her his cellphone number and then leaves. She calls Blade when she discovers that the mayor is actually draining the life of the undead's descendants to keep them alive. Gwen reunites with the MODOK crew once Arcade and puts them in a Murderworld shaped like a medieval dungeon, where they end up battling Deadpool. Gwen then helps Mega Tony get a job at Parker Industries and rescues Cecil, who was being chased by his frightened family members. After rescuing Cecil they went to Terrible Eye's apartment to ask how to make Cecil corporeal if not actually alive. Terrible Eye discovers a mystical gem being held by dwarves that could help, and opened a portal to a "moving door" that would lead to it, that Gwen quickly jumped through, with Cecil going after. She emerged inside Ghost Rider's trunk in Los Angeles while he and Hawkeye were both trying to stop the dwarves from completing a mystical ritual. Cecil ended up trapped in the mystical gem, which Ghost Rider put in his trunk as he drove away hearing the police sirens arriving. The next day, Gwen and Hawkeye go to Robbie Reyes' high school to retrieve the gem, but it ends up grabbed by the dwarves. Gwen enlists Ghost Rider to rescue Cecil, and it culminates in a battle at the Port of Los Angeles. During the battle, the dwarves release a giant creature to defeat the heroes. Cecil convinces Gwen to place the crystal on the creature's head, enabling him to possess its body. Gwenpool appears as a guest in a talk show talking in a positive way about the Hydra Empire while being threatened by a Hydra soldier. Gwen goes to visit the Earth-616 version of the Poole family despite MODOK's inability to find any records of Gwen existing before Doctor Strange's intervention, where she is greeted by her brother Teddy, who, for some unknown reason and with no real explanation, drags her back to her world (or a reasonably facsimile) before she can meet the Marvel version of her parents. She's then transported back to her universe, where she begins to live her normal life from the moment she left (2015) again with apparently no memory of her time in the Marvel Universe, which she hates. Gwen is drawn to a machine in a sleep study she volunteered for that could get her back to the Marvel Universe. Gwen is stopped from jumping into the vortex by her brother, who implies it's different to the way she originally entered the Marvel Universe, prompting her to reluctantly deactivate the machine and decide to go home. Then, while breaking the fourth wall and being confused by this, she sees a "The End" lying on the floor and picks it up before dropping and breaking it. It is then replaced by "to be continued" and a preview for #17, confusing Gwen. Gwen continues her life; by 2016 she is working at a cinema screening Captain America: Civil War. Aware that she is in a comic book, yet unaware of her time in the Marvel Universe, Gwen sees a giant title appears behind her and realising that she can see her thoughts in pink boxes. After some experimenting she thinks so much that her thought-box actually pushes her out of her bedroom window, making her "parents" think she tried to kill herself. After waking up in the hospital it becomes clear that she's being recommended for "observation". She mentions to her brother that she thinks she is in a comic book and questions him on what he knows. Nervous, he gives Gwen her notebook, who notices that the pages of her notebook where she drew MODOK and Batroc have been removed. Gwen then begins experimenting with the fourth wall again and successfully erases the walls between panels, leaving her with various versions of herself for company. Hearing a voice outside her door, Gwen climbs out of the panels, finding herself looking in on her life. Watching the past from outside the borders, Gwen sees in the "extra pages" of her Holiday Special, in which when her brother Teddy was sucked into the Marvel Universe, he ended up working for Orto the snake swordsman. Upon seeing her kill Orto's henchmen, Teddy runs into versions of Spider-Man, The Terrible Eye, and Vincent Doonan, who claim to be from a future where Gwen becomes a huge threat and destroys their lives. They offer him the chance to "return home" with his sister and fix things. Being concerned for Gwen's mental health, and having had a terrible time, he readily agrees. On finding this out Gwen, with her memory and costume restored, re-enters the borders, confronts Teddy for trying to undo the past and steal her dream of living in a comic, and shows him that their "parents" aren't real, and they never even left the comic. Terrible Eye explained that their attempts to send the Pooles to their home dimension created a pocket dimension almost identical to their real one created from their memories.The three realize that trapping Gwen was what led to her gaining her powers over reality in the first place. As they plan to undo it, Spider-Man takes Gwen to a remote cliff, intending to kill her after explaining why he feels she needs to die; which involves her having revealed his secret identity to the world, getting his family killed, and kicking off Civil War III. Explaining that the future evil Gwen was unable to follow them due to being unable to track Teddy, Gwen realizes that she can see Miles' flashback and that the future evil Gwen, giant sized, has followed him to the present, who promptly frees her. Future Gwen battles Spider-Man, Terrible Eye, and Doonan, while each side tries to convince the present Gwen to join their cause. Future Gwen turns out to be weakened by Present Gwen’s doubt but gradually re-strengthening nonetheless. She then effortlessly kills Doonan, Terrible Eye, and Spider-Man, horrifying Present Gwen. Future Gwen explains to her past self that she became a villain because she was tired of her good deeds being undone as the plot progressed, so she turned to committing evil that could always be undone on characters that “matter”, demonstrated when Spider-Man’s death is retconned a moment later because he’s too important for the story to kill. However, Present Gwen is disgusted at the idea of hurting the characters she’s grown to love, and wipes her future self from existence. This comes at the cost of erasing all of the Evil Gwen stories and so dramatically shortening Present Gwen’s lifespan. Having made friends in Marvel and learning that the universe is attempting to make her into a joke villain, Gwen wants to make sure her evil self never comes to be. To catch the attention of the Avengers she decides to go on a trip to Latveria in an ill-advised attempted face off with Doctor Doom, still thinking him to be evil, having never read Infamous Iron Man. It is revealed that she and Cecil, now in his mystical monster body, share an apartment and since she has given up killing people is hacking to pay the bills. She then faces off with a snake-man in the sewers, somehow making him vanish much to the surprise of the police, especially Officer Gray who still does not understand why she seems unable to arrest Gwen and her fellow cops even let her go. Gwen's comment about cops not working like that in "real life" seems to have connected with her. A short time later after rescuing Vincent Doonan from Paste Pot Pete and throwing him into the void between comic panels as a demonstration of her new superpower (which is apparently okay since he's only a D-ranked and rarely used villain), Gwen asked Vincent where to find the real Doctor Doom so she can defeat him and join the Avengers. But, it turns out Doom was watching through Vincent the entire time and thinks he is ready for her. Using Vincent he traps Gwen in a cell and is not a little bit surprised when she escapes and appears just as he is telling his AI doombot how proud he is of him. He explains he's reformed, but Gwen still wants to defeat him. Doom sees her disappear around "a corner of reality", but is unable to predict where her attack comes from. using a sword she cuts him, releasing the evil Doctor Doom from within him. Said Doctor, palming the current version's face like a basketball, threatens to give Gwen exactly what she wanted: DOOM! After a brief fight in which she realizes she can't kill him the real Doom shows up outside the comic and destroys his evil past self doppelganger. He and Gwen have a chat about why she wanted to kill him, which turns out to be because since destroying her evil destiny self, her comic pages are running out and she believes she is doomed to be cancelled. With only a few pages left, once Doom is gone, she wonders if she has to become a super villain. In the next issue she teams up with Batroc and the two rob a casino, but he reveals that it was owned by a bad guy so her attempts to be a villain fail. Bidding him a fond farewell, certain that another author will make him into a jerk again, Gwen is about to give up when a version of herself from the future appears. In the final 25th chapter of Unbelievable Gwenpool #1 the Gwen from the future (who looks just like current Gwen but with slightly longer hair because according to her Marvel characters don't age unless it's in the title) explains that while her first comic series has ended, she's already in several other comics, toys, games and so on not to mention fan art and the like. Even if she doesn't keep going right now she and her side characters will return. Meanwhile in between these pages Gwen carries out a plan using a mystical rocket launcher to defeat and embarrass Dormammu to retrieve a device Dr. Doom, Stephen Strange, Terrible Eye, and Vincent Doonan use to restore Cecil to human form and make his monster body friendly. She is given a watch that counts down her pages and uses the rest, one page at a time, to see old friends, team up with new superheroes, rescue her brother from Hell, explain her and Teddy to the Marvel Universe counterparts of her parents, and chase off M.O.D.O.K. one more time. Then we see that in the future one of Gwen's fans, a young girl is picked on and Gwen flies in on Fin Fang Foom in a parody of The Never Ending Story to chase the villains into a garbage can. Decades later when the little girl is old and dying in a hospital, the Future Gwen is with her sad to see her go but the girl understands because after all, she's an extra. Future Gwen then goes back to where the chapter started to talk to her past self, creating a loop. While visiting Kate Bishop in Los Angeles, Gwen is drafted to join the accidentally reformed West Coast Avengers. She instantly got in conflict with one of the members, Kid Omega, but was still the one who had to save him when he was swatted away by a giant Tigra. Their clashes and shouting matches eventually evolve into passionate kisses. However, Gwen claimed she only started the affair with Quentin for feeling a romantic plot would make her less of a supporting player and thus less threatened to die. Along with the other Avengers, Gwen helped stop giant monsters created by the original M.O.D.O.K. and was captured by an alliance of villains headed by Madame Masque before Kate saved them. After nearly being killed, an alternative version of Gwen merges with the Venom Symbiote. As two thugs prepare to make an arms deal, this Gwen recants how she "was originally from the real world but was transported into the world of Marvel Comics, became a mercenary to have fun killing fictional characters, and became the main character of her own series", unaware that she is not the real Gwen. This Gwen speaks of having been a mercenary but gave it up to become a superhero after bonding with the Venom Symbiote, its original owner having been "real eager" to give it away. She approaches the two thugs, who tell her to leave. When she challenges them, narrating that her one weakness is that she doesn't have superpowers, they open fire on her and riddle her with bullets. With Gwenpool seemingly dead, the two thugs continue to prepare to make the arms deal. However, Gwen narrates that she used to not have powers as black ooze emerges from her wounds, expelling the bullets and transforming her into a monstrous version of herself. She notes that she acquired the Venom symbiote from someone desperate to get rid of it, and finally had the powers she needed to become a real superhero. Getting up, the Venomized Gwenpool gleefully confronts the thugs before being attacked from behind by shuriken. Turning, she sees a group of Hand ninja, which the symbiote tells her to eat. Devouring them, Gwenpool gloats about how foolish they were to attack her in a group, invoking the "Inverse Ninja Law". The remaining Hand ninja flee, much to her disappointment, as the symbiote is still hungry. Daredevil then appears behind her, irately noting he wanted to interrogate one of them, and Gwenpool is smitten by how handsome he is. When Daredevil asks who she is, Gwenpool admits she hasn't thought up a new codename for herself, considering "Venompool" and "Venpool", while apologising for killing them all. Daredevil states that much as he loves beating up the Hand, he's trying to investigate their increase in opioid sales. Daredevil bids her goodnight, resolving to continue his search the next day. The symbiote chides Gwen for her being disappointed that Daredevil is leaving, accusing her of going soft and saying it needs her vicious. Gwenpool abruptly realizes she's going to be late for work, wondering why Daredevil looked so much younger than she had thought he would be. The symbiote tells her that this is because they're living in an alternate universe rather than Earth-616, to her surprise. They symbiote tells her that bonding to her has given it unique medium awareness and knowledge of the Marvel Multiverse, though Gwen laughs off the idea that they're living in a What If?. As Gwenpool lands on the roof of her place of employment, the rooftop access door opens and she quickly transforms the symbiote into a black suit, pink shirt, black skirt, and glasses. As she converses with her coworker, who remarks on her resemblance to Gwenpool, the symbiote sardonically mocks her insistence on maintaining a secret identity, particularly her choice to wear glasses. Gwen's boss, a lawyer named Mr. Melville, berates her for being late as she enters carrying his paperwork and a pot of coffee. However, she is dumbstruck when she sees Matt Murdock seated at the table. She expresses concern that he'll sense the symbiote, which informs her that it's replicated the scent of a tasteful perfume just for her. While Murdock grills Mr. Melville over his client's hot sauce facility producing toxic substances, Gwen doodles childish pictures of herself and Daredevil as a couple. Gwen angrily watches as Mr. Melville mocks and insults Murdock, who leaves threatening to bring the case before a judge. The symbiote suggests they kill Mr. Melville for being mean to her crush, and Gwen admits that she's strongly tempted to go through with its suggestion. Mr. Melville takes his notes from her and leaves, with Gwen realizing seconds later that she'd accidentally left her doodle - which reveals Matt Murdock is Daredevil—inside the folder. When she tries to get the folder back, Mr. Melville brushes her off and leaves. As Gwen panics, the Venom symbiote suggests killing him again, then pulls the fire alarm. Mr. Melville leaves to work from his home, with the symbiote suggesting they follow him and kill him there. When Gwen refuses, it points out that they needed to go there anyway to retrieve the folder. Gwenpool tails Mr. Melville to his penthouse apartment, not noticing she herself is being followed by Daredevil. She plans on simply grabbing the folder and escaping, but the symbiote points out that he may have already seen her drawing and that they should kill him to be sure. When Gwen asks why it's obsessed with killing her boss, the symbiote points out that she hates Mr. Melville herself, and that none of the events occurring around them are canon - by all rights, she shouldn't even be bonded to it - and that therefore they can kill anyone they want without it mattering. Noticing the file on Mr. Melville's desk, Gwenpool finally gives in the symbiote's urging to kill her boss but is attacked from behind by Daredevil. Daredevil reveals he knows who she is based on the awful perfume she was wearing. Annoyed at the symbiote, Gwenpool scraps with Daredevil while trying to tell him she's trying to protect him, just as Mr. Melville finds her drawing. As the fight between Gwenpool and Daredevil spills into his apartment, he calls out for assistance from his ninja, to Gwen's confusion. Seconds later, a group of Hand ninja emerges from various secret entrances to Gwen's outrage. As Gwenpool and Daredevil fight the Hand ninja back to back, the symbiote urges her to kill Mr. Melville before he figures out who she is. Gwen tells it that she's not about to do something that'll make Daredevil mad at her, confronting her boss over his dealings with the Hand. Mr. Melville pulls out a pistol and shoots at Daredevil, but Gwenpool morphs her arm into a shield and the bullet ricochets back and kills him. As Mr. Melville topples out the window, Gwenpool snags the drawing and leaves with Daredevil. Sitting together on a rooftop, Gwen apologises for almost revealing his secret identity, though Daredevil is more amused than upset and commends her for not killing anyone. As he leaves to patrol the streets, the symbiote notes it is happy that her boss died, though Gwen scolds it, saying she needs to find a new job now. Daredevil seemingly returns, asking if Gwen wants to accompany him. The symbiote warns her that something is wrong, but she ignores it and follows him around a corner, where she meets an uncertain fate. The real Daredevil arrives looking for her. It is later revealed that Gwen was attacked and absorbed by the "Poisons" and that the reality this Gwen comes from is the reality in which the majority of the events of Venomverse are set. She is killed by that dimension's Deadpool who has been infected by and is successfully resisting the Poisons after she explains the Poison's purpose. Deadpool describes her as simply having been a "knockoff of a knockoff". An alternate version of Gwen appears in the third issue of this miniseries. Gwen is hired by Moon Knight and the Punisher to find the location of definitely evil versions of Magneto, the Red Skull, the Abomination and Doctor Doom, who are controlling Deadpool to kill that Marvel Universe's heroes. As Gwen sends the photos, the Abomination proclaims "I've got her", leaving her fate unknown. Losing reception, Moon Knight remarks: "Until we hear from her again, we should assume Gwenpool's DEAD." In the same issue, it is revealed that the series takes place in a reality similar to that of Old Man Logan, as Deadpool comes across the X-Men's Mansion after Mysterio tricks Laura Kinney / Wolverine into slaughtering the X-Men. Old Man Logan realizes that this is what is happening over the course of the issue. Later, in the fourth issue, Gwenpool is revealed to be alive, asking the Tinkerer to ask her "a few quick questions". Gwen proceeds to torture the Tinkerer, realizing that her "super-hero pals" aren't answering any of her texts and calls and that the Tinkerer's masters have been using Deadpool to kill them. Gwenpool threatens the Tinkerer with more torture if he doesn't tell her how to break Deadpool's trance to stop him from killing everyone. Gwenpool then comes across Deadpool as he kills Nova, the last remaining superhero other than Gwenpool, and attempts to knock him out of his trance. Deadpool mocks Gwen as simply being a "variant cover knockoff" and "a Deadpool -- in pink!". Gwenpool, suddenly impaled, uses her last moments to reverse Deadpool's trance, redirecting him towards the supervillains using the trigger phrases she learned from the Tinkerer. Gwenpool begs Deadpool "don't let them get away with it", as he proclaims: "Bring on the Bad Guys". Gwenpool originally had no real superpowers, having vast knowledge of the Marvel Universe from comic books in her universe, such as every secret identity of both heroes and villains. She has used this information to take down Black Cat's criminal empire and to stop Thor from attacking her. She is able to exploit her fourth-wall knowledge to her advantage, understanding when comic-book tropes will allow her to avoid unpleasant or life-threatening consequences. Gwen has repeatedly demonstrated that she can't be arrested for long due to her superhero status and has also, on several occasions, survived falls that should have killed her. In fact she specifically told Howard the Duck that one of her favorite things was leaping from tall things and not dying. Things that should injure her sometimes have no effect, and when she is injured she heals quickly. We see Gwenpool trained in hand to hand combat by Batroc during the Unbelievable Gwenpool Vol. 2. Apparently, Batroc trained her in Savate and some swordplay. She continued to train after she left Batroc and with her skills much improved, she was able to take out a group of minions by herself while on the West Coast Avengers. Jumping kicking and using her Katanas fluidly. Gwenpool is medium-aware, meaning she can step out of and into comic panels, alter fictional characters (such as she does to Doctor Doom), dump characters into the "gutter space" between panels, interact with word bubbles or use her knowledge of the Marvel Universe to determine characters’ weaknesses. In West Coast Avengers, Gwen notes she is not fully able to exploit the comics medium with her powers as she did in her own title, making her think it was part of a character reboot. 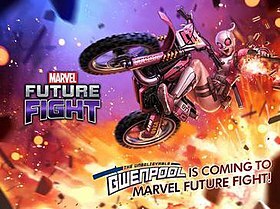 Gwenpool appears as a playable character in Marvel Future Fight. Gwenpool is featured in Marvel Puzzle Quest. Gwenpool appears as a playable character in Marvel Contest of Champions. During the game, there's also an antagonistic Gwenperion, which M.O.D.O.K. has infused with Hyperion's powers. Gwenpool appears in Lego Marvel Super Heroes 2, voiced by Becca Stewart. She replaces Deadpool as the host of the bonus missions, and continues to have medium awareness, as her introduction has Gwen noting her body is now the one of a minifigure. The Japanese release of Vol 1. came with a different trade cover. ^ "Gwen Takes Over". Marvel.com. 14 April 2015. ^ Johnston, Rich (August 21, 2015). "And Finally… Has Marvel Noticed That Gwenpool Is A Thing Now?R". BleedingCool.com. ^ a b "Marvel announces new Gwenpool series". Entertainment Weekly. December 22, 2015. ^ "MARVEL ANNOUNCES "GWENPOOL HOLIDAY SPECIAL," "HOWARD THE DUCK" BACKUP STORIES". Comicbookresources. September 11, 2015. ^ "Marvel Cancels Gwenpool, Generation X, Hawkeye and Potentially More". CBR. 2017-12-19. Retrieved 2017-12-20. ^ Christopher Hastings made the deliberate choice not to explain the mechanics of how Gwen Poole crossed into the Marvel Universe. In a farewell letter in The Unbelievable Gwenpool #25, he revealed it was the fans, making content based around Gwenpool that elevated her from a simple idea for a variant cover, thus creating a collective force that pried open the walls of the Marvel Universe and shoved Gwen inside. ^ Howard the Duck Vol. 6 #1–3. Marvel Comics. ^ Gwenpool Holiday Special #1. Marvel Comics. ^ The Unbelievable Gwenpool #1. Marvel. 2016. ^ a b The Unbelievable Gwenpool #2. Marvel. 2016. ^ The Unbelievable Gwenpool #4. Marvel. 2016. ^ Rocket Raccoon & Groot #8-10. Marvel Comics. ^ Gwenpool Holiday Special: Merry Mix-Up. Marvel Comics. ^ The Unbelievable Gwenpool #6. Marvel. 2017. ^ The Unbelievable Gwenpool #7. Marvel. 2017. ^ The Unbelievable Gwenpool #9. Marvel. 2017. ^ The Unbelievable Gwenpool #10. Marvel. 2017. ^ Champions Vol. 2 #5. Marvel Comics. ^ The Unbelievable Gwenpool #11. Marvel. 2017. ^ The Unbelievable Gwenpool #12. Marvel. 2017. ^ Secret Empire: Brand New World #1. Marvel. 2017. ^ The Unbelievable Gwenpool #16. Marvel. 2017. ^ Edge of Venomverse #2. Marvel Comics. ^ Venomverse #4. Marvel Comics. ^ Deadpool Kills the Marvel Universe Again Vol. 1 #3-4. Marvel Comics. ^ West Coast Avengers Vol. 3 #8. Marvel Comics. ^ "Gwenpool In Comics Profile | Marvel". Marvel.com. Retrieved 2018-08-11. This page was last edited on 27 March 2019, at 16:30 (UTC).